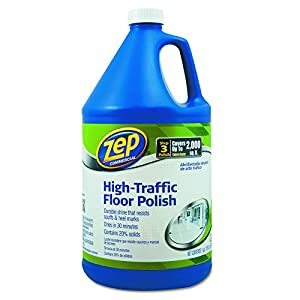 Best Garage Floor Cleaner Reviews: Only 10 Out of 76 for April 2019! Looking for the Best Garage Floor Cleaner? Here’re Top Rated Products! Do you want to clean the garage floor in order to paint it afterwards? Or, maybe, you are going to apply a new epoxy flooring and want everything to be perfect? Well, the reason doesn’t matter. If the floor is dirty, you have to clean it — and to do this, you have to know a lot of things about the process. Let’s talk about it. So, in the absolute majority of cases, the garage flooring is concrete or cement. Well, some people use hardwood, but it’s a very exceptional case. That’s why I’m gonna talk about the best way to clean concrete floor here, and I hope that this advice would be relevant to your certain situation. However, some of the cleaners would also work perfectly for wooden floors. Let’s talk about what you need to do if you are looking for how to clean concrete garage floor. You’ll need three things only: a cleaner, a mop and time, of course. The process is quite simple..
At first, clean the floor (sweep it and move everything out). Then spray it with water. After that, you’ll need a cleaner and a brush or a mop. Most of the cleaners are dangerous and you’ll have to use protective equipment with them. You’ll have to scrub the floor with a mop. In some cases, you’ll have to wait for 10 minutes. If it doesn’t help, scrub it again. Then you’ll have to wash the floor and let it dry. Of course, if it’s not enough, you’ll need some additional tools, like a pressure washer. As for the cleaning agent, there are some details here, too. The thing is, there are four types of concrete cleaners, so the choice is quite difficult. I’m gonna explain the differences, but without getting into too many details. 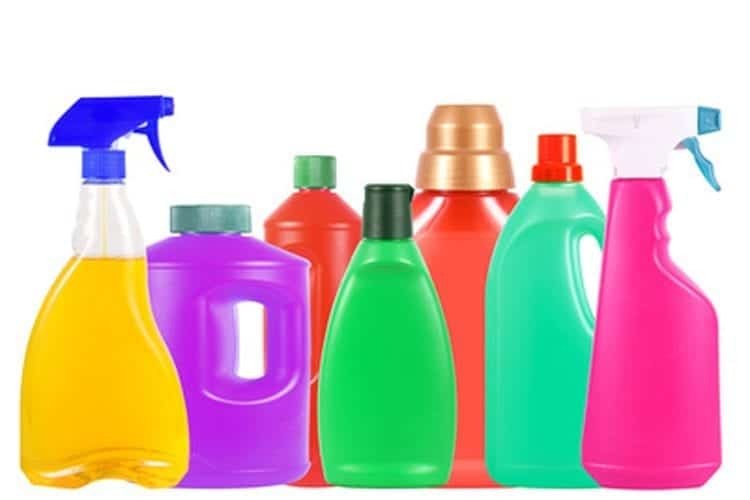 So the first type is the acidic cleaners — they may contain muriatic acid. It’s a powerful acid that will remove all the stains. People are often interested in how to clean garage floor with muriatic acid, but there are no special rules here. Well, except the safety rule — muriatic acid is a very dangerous material so you’ll have to be careful with it. Glasses and gloves are necessary. The second type is alkaline cleaners. They are perfect for non-painted surfaces, and they are not as dangerous as the acid cleaners. A cleaner such as this is a very cost-effective solution. The third type (pH-neutral cleaners) is fine, too. They are not the best choice if the floor is extremely dirty — so if you want to know how to remove old oil stains from garage floor, I can say that they are not the best choice for you. The 4th type is called bacterial cleaners. They consist of bacteria (or enzyme) that consume the dirt. You don’t need to dilute such cleaners with water — just pour it and wait, that’s all. 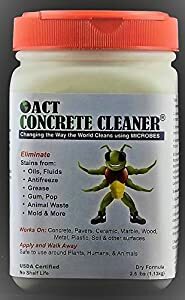 It’s an amazing cleaner that can easily remove oil and grease spots/stains from the concrete. The same is true about animal urine stains and rust — but what you have to know is that it doesn’t clean the dirt immediately. 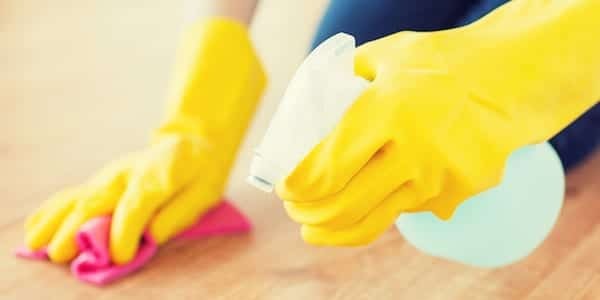 This ACT product is a microbial cleaner, which means you have to pour it on and to wait for a few minutes, hours, or if the floor is very dirty, several days. It’s a very good choice if you live in cold weather — this cleaner can work even in the low temperatures, unlike the majority of cleaners. The description says that it can work at -69 F (-56 C), so you can use it even if you live in Alaska! I like this one because it works well both for concrete, hardwood and all the other floors. 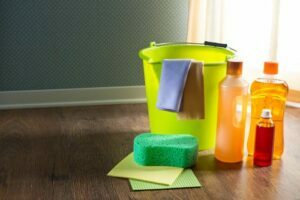 It means that whether you are looking for a cleaner for mechanic shop flooring or a cleaner for your home’s wooden floors, this would work perfectly. 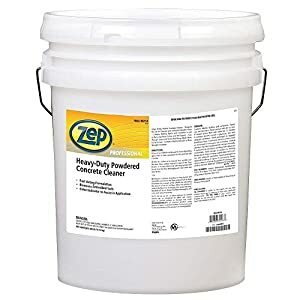 Well, this Zep cleaner is the best choice if you want your floor to shine, but it’s also very good for cleaning the concrete floors. It’s a pH-neutral cleaner which is very easy-to-use — you’ll only need a mop to start working. I also like its price — it’s a very cheap cleaner which doesn’t go too fast. Please, note that it isn’t the best choice for laminate floors. 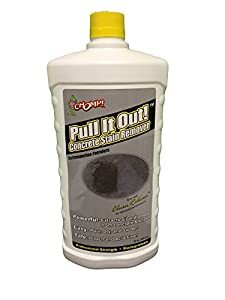 It’s a perfect automotive shop floor cleaner. Why? Because when you work in an automotive shop (or own the one), you have two things that must be cleaned almost every day: your floor and your clothes. 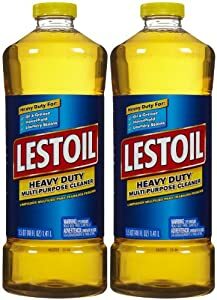 Lestoil cleaner is the perfect product for such cases because you can clean everything with it: clothes, concrete floors, walls, car seats, etc. It’s a must-have cleaner in every household, that’s what I can say about it. But please note that washing white clothes with this cleaner wouldn’t be a great idea. It may damage such clothes, so I recommend not to do it. This cleaner is awesome. As you can see from its name, it was designed for cleaning concrete floors — and it’s very good at it. 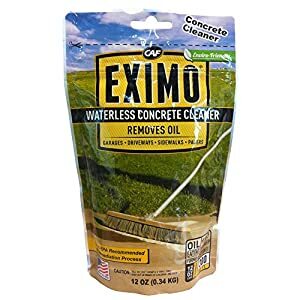 This cleaner removes everything from the concrete surfaces, so with this one, you’ll forget about oil and all the types of dirt. It’s quite expensive, but, well, I guarantee that you won’t regret if you decide to buy it. 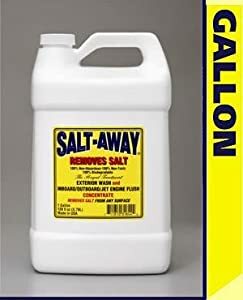 It’s a very economical product and you will use this 40-lb for a very long time. 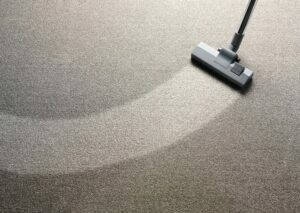 It’s another bacterial cleaner, which means it contains special bacteria that clean the surface from all kinds of dirt. It’s really good when it comes to concrete floors, and of course, it copes with oil stains perfectly. That’s why I think that it’s one of the best options for your garage floor. It’s also a very cheap product and a very economical one — even if you have a lot of old stains on your garage floor, these bacteria know how it should be done. However, if you are looking for a cleaner that would clean the rust, that’s not the best choice for you, because these bacteria aren’t very good at removing rust. II can’t say too much about this and about the following cleaners. They are good, cheap and they work — so I’ll only mention the details. Chomp 52019 is good for concrete and brick surfaces. It’s safe because it contains no acid. I would describe it like this: if you need to remove oil stains from concrete, that’s the best choice. If you want to buy a product that would work well for all the other garage surfaces (like a door, for example) — that’s probably not what you need. It’s the easiest-to-use cleaner in this list. It’s a waterless bacterial product — just pour it on a stain or a spot and wait until the work is done! This cleaner is very cheap, very easy to use, very effective and copes very well with the concrete floorings. I recommend it even if you haven’t ever tried bacterial cleaners because it’s really safe and you will have no problems with it. Try right now! It’s probably the most multifunctional cleaner on this list. 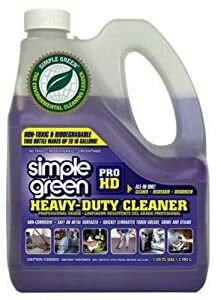 Dozens of possible uses (from the kitchen to garage, from cleaning your car to cleaning your shower), low price, good feedbacks — what else do we need? But here is a little problem. 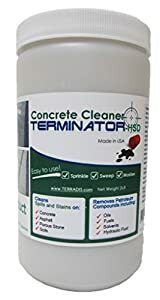 It’s a multifunctional cleaner-for-everything, while the narrow specialization is the key — so if you want something for your concrete garage floor only, I’ve included some better options in this list. However, if you are looking for one cleaner to clean your car, shower, kitchen, and garage, this one would be a great choice. Oil eater eats oil! It’s perfect for the concrete floor in your garage, but it copes perfectly with asphalt, too — as well as with the absolute majority of surfaces. It’s a very safe product, which means it doesn’t contain any acids and toxic materials. If you are looking for something perfect, try this one. 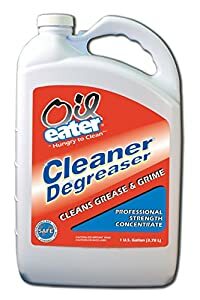 It’s literally the best oil cleaner on my list. Do you know how to clean garage floor after winter? You’ll have to remove the salt stains at first, and there are only a few cleaners that cope with that. This is probably the best of them. This cleaner washes the salt away from almost all types of surfaces, and you want to clean a garage floor after the winter and to repair the floor, damaged by salt, you won’t find a better solution. That’s not all. You’ll also have to buy a brush, and I highly recommend to pay attention to this one. It’s one of the most popular mops, and it’s really good — lightweight, 360 spin and perfect for concrete walls. I also recommend buying this brush, because it was designed specifically for concrete floors. With these two, you’ll clean your garage really fast!